Downtown residents’ organization. Meet your downtown neighbors, learn about issues and get involved in your community. Living downtown has its benefits – and its challenges. The energy and music and fun that attracted you to downtown living is not so appealing when you decide to turn in early and catch up on your sleep. On a Friday. And when your favorite busker hangs out under your window and starts playing her best ‘kick up your heels and be glad you’re alive’ tune for the fifth time that evening, you begin to pray for rain. Heavy rain. Asheville has tried to manage the competing interests and our noise ordinance has a standard of reasonableness. Which makes sense, as some noise that perfectly reasonable at 4pm is absolutely unacceptable at 4am. Enforcement is complaint-driven. This means you have to call and complain. The police are great and do their best to find a middle ground. Please remember that the police do have to respond to emergencies first and you may not get someone right away. It also helps if your neighbors are calling as well – remember, it’s a standard of reasonableness so the more folks who find it unreasonable, the easier it is for the police to be firm. So don’t wait for your neighbor to call; you should all call – 828-252-1110. If you have an emergency and need an immediate response, call 911. Noise issues, graffiti, theft, vandalism, aggressive panhandling, someone who might need help but it doesn’t seem to be an emergency – call the police non-emergency number. Downtown is popular and parking can be hard to find. Regardless of how inviting those open spaces in a private lot might look, do not park without carefully looking for and reading the signs. Many private lots are reserved for tenants or customers and most have 24/7 enforcement. You can be ticketed ($15 and up), booted ($50 and up) or towed ($195 and up). Pay attention as it can be a very expensive mistake and could ruin an otherwise great experience downtown. There are a number of garages – City-owned and private – and many private lots and street spaces will allow you to pay by phone. 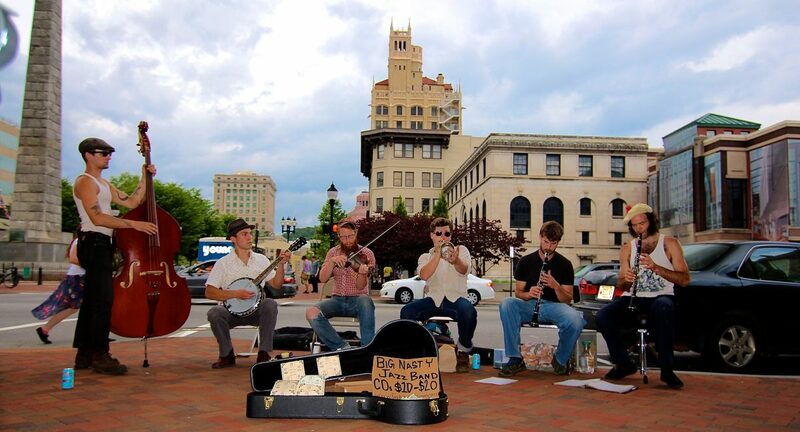 Asheville has a number of talented musicians who make their living by busking (street performers). Support the arts at the grassroots level. Tip a busker. For information on busking etiquette, click here. Want to learn more about Asheville’s talented Buskers? Catch the documentary film by Erin Derham called “Buskin Blues“. Enjoy a trailer to Erin’s film.